The area of the dam is pretty arid and beautiful. Located across the Nile river, the dam controls the flow of the river. 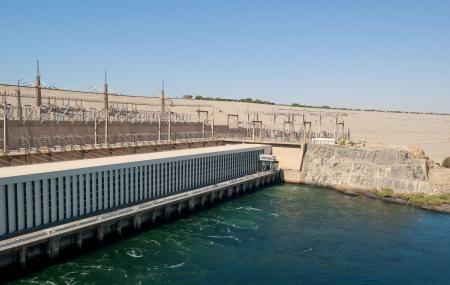 The high dam, commonly known as the Aswan dam holds great importance as if it wasn't for the dam, the Nile river would be flooded throughout the year. A glimpse of the dam is bound to urge you to take a boat ride in Lake Nasser, which however wouldn't be a bad idea. Do not swim in lake Nasser. Tary visiting the place during the day. How popular is High Dam? People normally club together Temple Of Isis At Philae and New Kalabsha while planning their visit to High Dam. Just south of Aswan, about a 25 to 30 minute drive, you'll find this extraordinary piece of engineering. I found the drive there quite pleasant as you drive out of the city and past a desert-like landscape. There are incredible views of Lake Nasser. You'll have to go through a few police checkpoints to enter. While there, you'll see photographs of the dam when it was constructed. Snack bar and restrooms are available. Great engineering work. Good to visit the "Egyptian Soviet Friendship" symbol which is tower that has good views and an amazing architecture. You feel like you are back in the Nasser 60's era. Interesting if you enjoy seeing engineering feats... Probably best to visit with a guide who can tell you a bit about the dam. Pretty views from the top. One of the great dams of the world and worth a trip if you are in the area. I would not make a detour like I would for Hoover Dam, but if you are in the area... If you are not into engineering, the area is pretty. Nice views of the military monument. Biggest draw for me is the lack of peddlers. The security presence on the dam is high, and I guess this keeps them away.